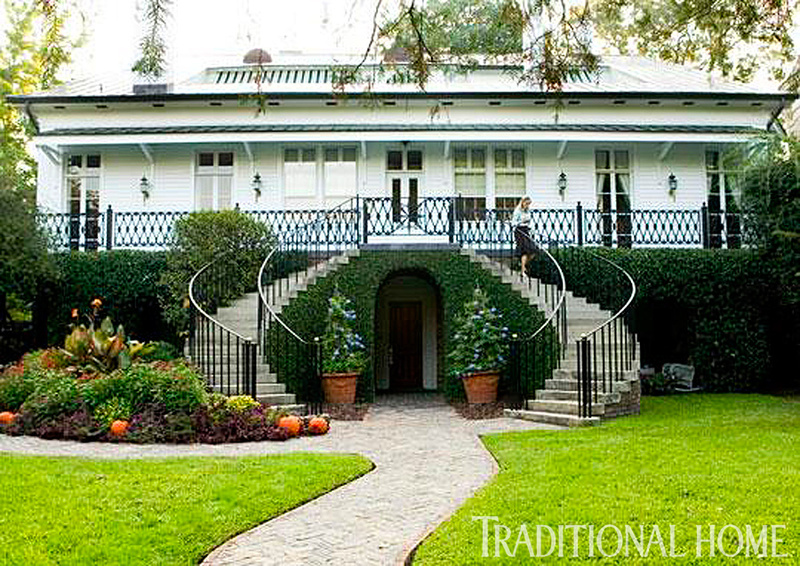 Jeanne and Peter Holliday transformed their simple Georgia cottage into an elegant antebellum home by the addition of this graceful sweeping staircase that leads into the garden and its formal geometry of the simple four-square plan. 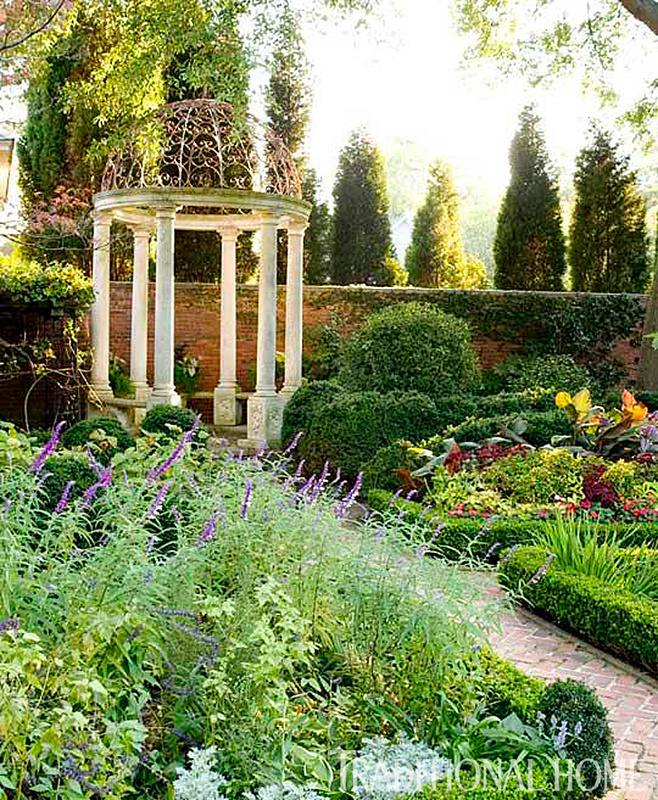 Decorative touches like the scrolled ironwork gates and the old metalwork arbor contrast the linear design of the garden with its straight brickwork paths converging on a central pool and fountain. 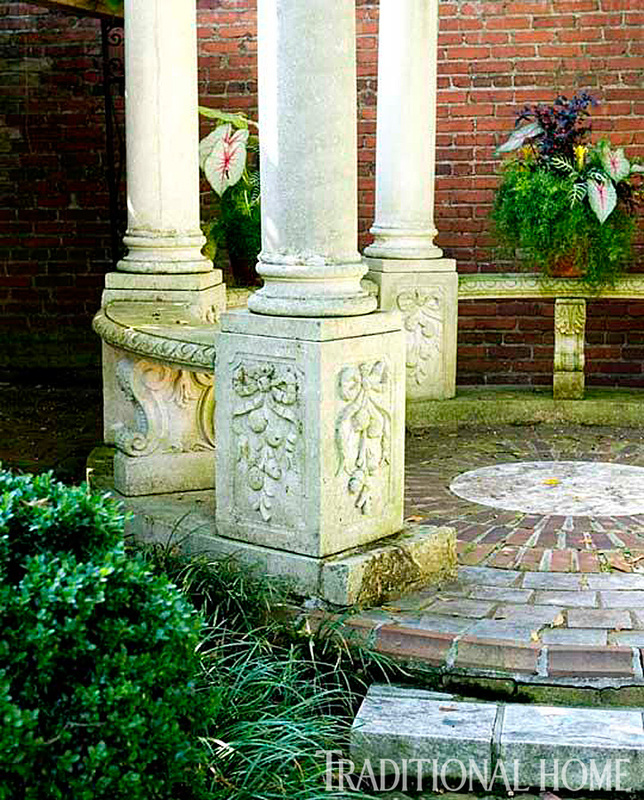 Even though the garden plan is so simple, by introducing elaborate touches like this classic rotunda the design is kept lively and interesting. Boxwood edged borders around each bed heighten the formal plan. Each column of the rotunda is supported by a plinth decorated in deep bas-relief; the stone benches below the dome give a place to display pots of exotic foliage plants as well as to sit and consider the garden from another angle: even the smallest garden needs its resting places. The marble fountain is decorated with a pattern echoing the shapes of lotus flowers and leaves. 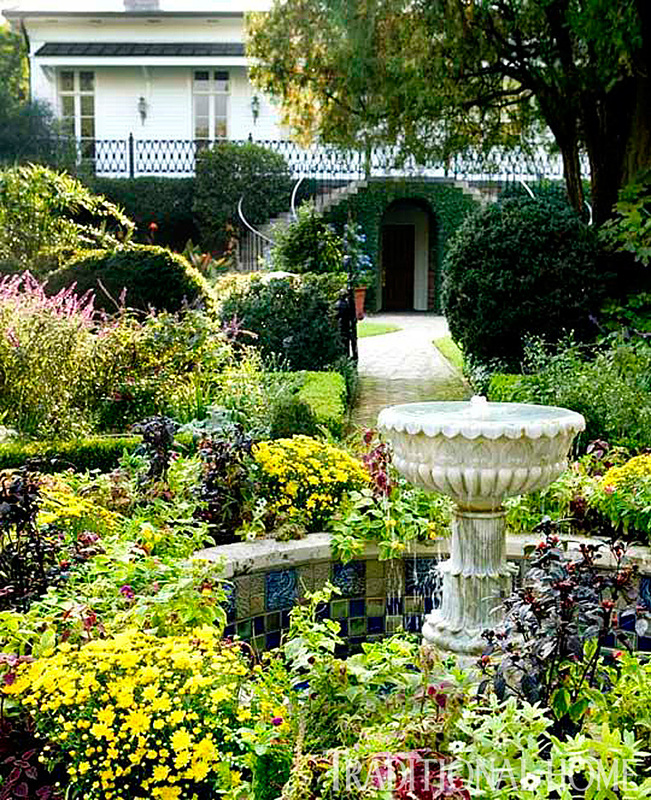 As the central feature of the parterre it is extravagantly planted with golden yellow mums and myriad coleus, zinnias, and ornamental pepper plants. 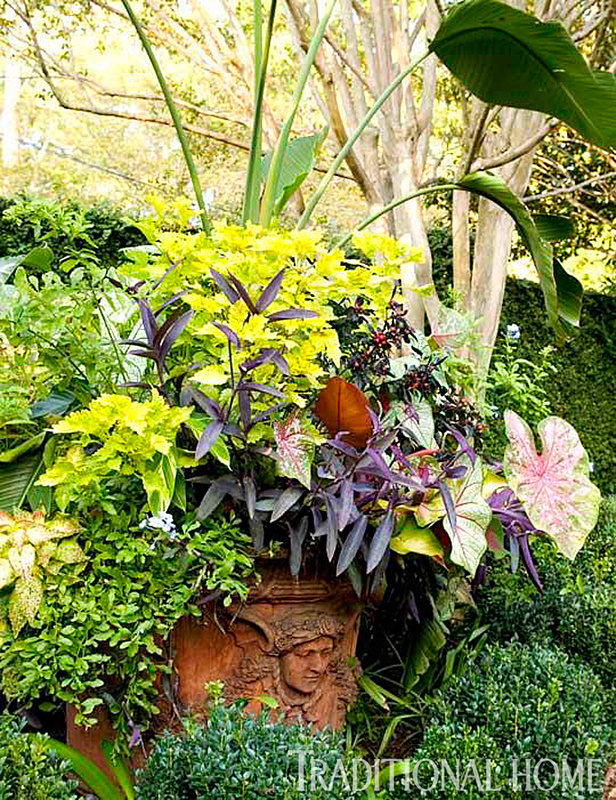 Vintage terra-cotta urns are large enough to contain a huge selection of tropical foliage plants. A banana plant is the focal plant around which upright growing yellow-leaved coleus, purple-leaved ornamental peppers and several sorts of variegated caladiums cluster. These are underplanted with trailing plumbago and tradescantia with narrow plum-colored leaves to make a full and extravagant display with hardly a flower in sight. Gardens in shady places tend to be predominantly green, since so many foliage plants perform best in low light. Hostas, ferns, and the like need cheering up, and coleus (genus name Solenostemon) are here to do just that, which is why they are lately so much in vogue among garden designers and anyone who appreciates exotic variegated foliage. 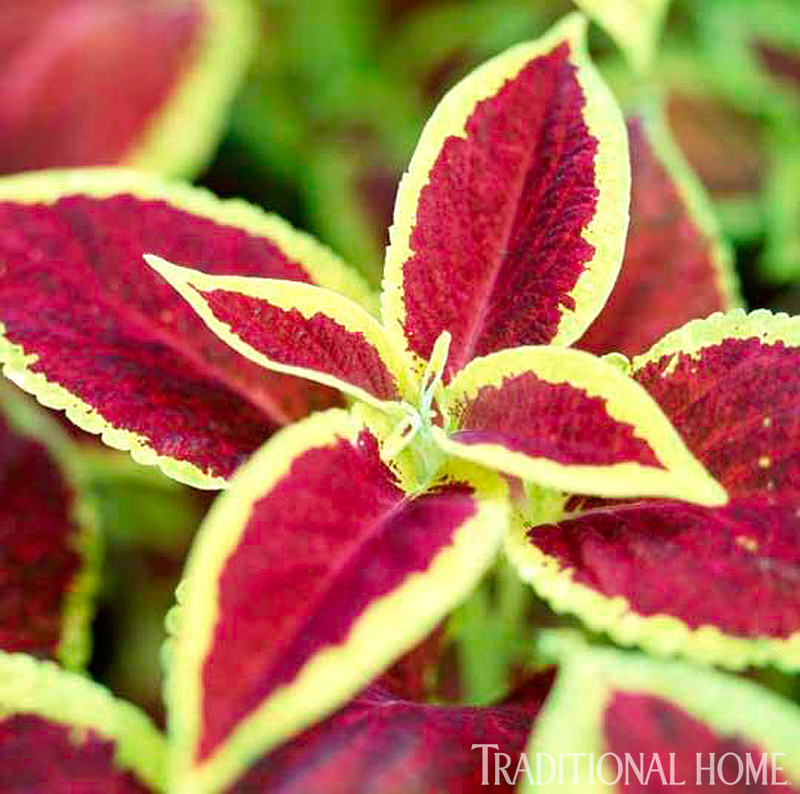 In hot climates, coleus can be grown as permanent shrubby perennials, but once you move out to Zones 9–7, the top-growth may well be nipped back by frosts, but will reshoot from the roots. Everywhere else coleus are annuals to be replanted every year. And that gives plenty of opportunity to try all the many, seemingly hundreds of hybrids. In the Holliday garden, coleus are used as filler plants among the caladiums, mums and other long-season plants that fill the parterre and cluster around the foot of the sweeping staircase. 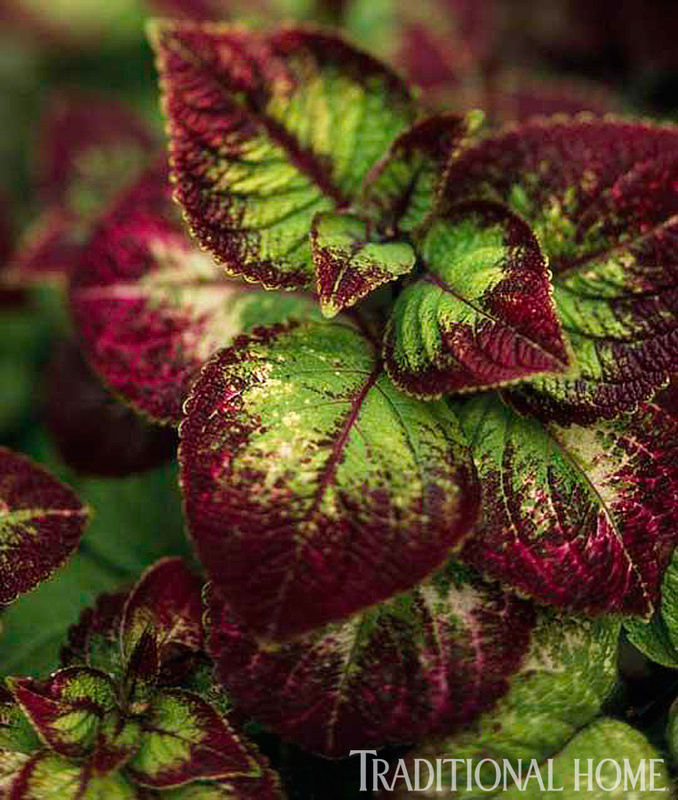 Coleus can be grown in sunny spots, but then the foliage never develops the rich burgundy, purple, amber, gold, chartreuse, pink—the color range is wide and wonderful, so plant them full or dappled shade. When plants are young the growing tips of each branch should be regularly pinched out to encourage a full, bushy shape. The flower stems can be extremely tall and so it can be tempting to leave them, but they should be removed to keep the plant growing, to keep it nicely compact and maintain leaf quality. Coleus will do well in the borders if the soil is well-drained but moist, but also make great container plants, especially with large-leaf exotics like colocasia, alocasia, bananas and so on. But be sure to keep them well watered. There are varieties that grow into tidy little hummocks, and others that will grow up to three feet. Some have leaves that are frilled around the edges, or deeply dentate, while others are nearly round or perfectly oval. And the variegation comes in blotches, stripes, speckles, or as contrasting edging or feathered along the midrib of each leaf. 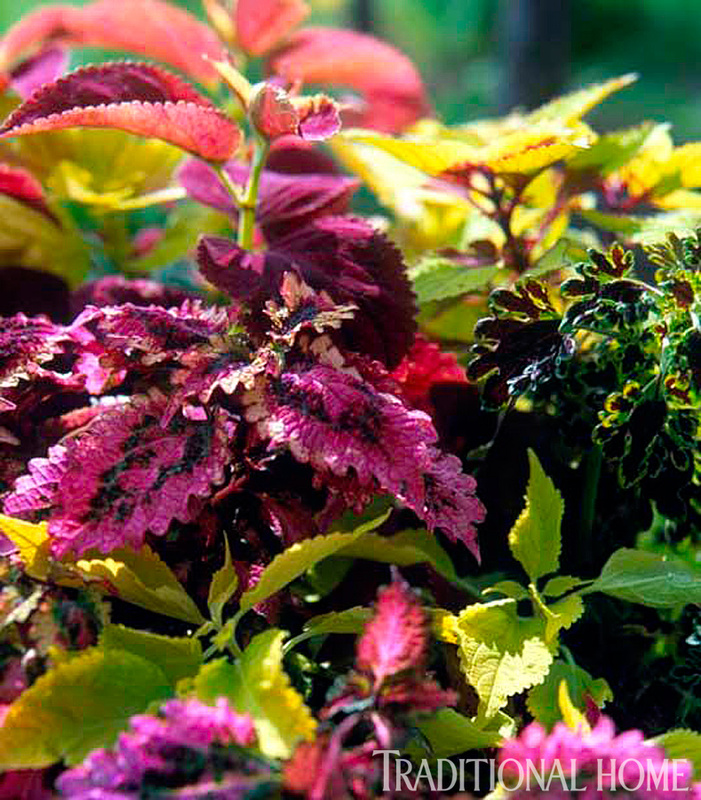 The temptation is to make a garden display of only coleus…now that’s an intriguing idea.